Best Ornamental Grasses to add year long interest to your garden. 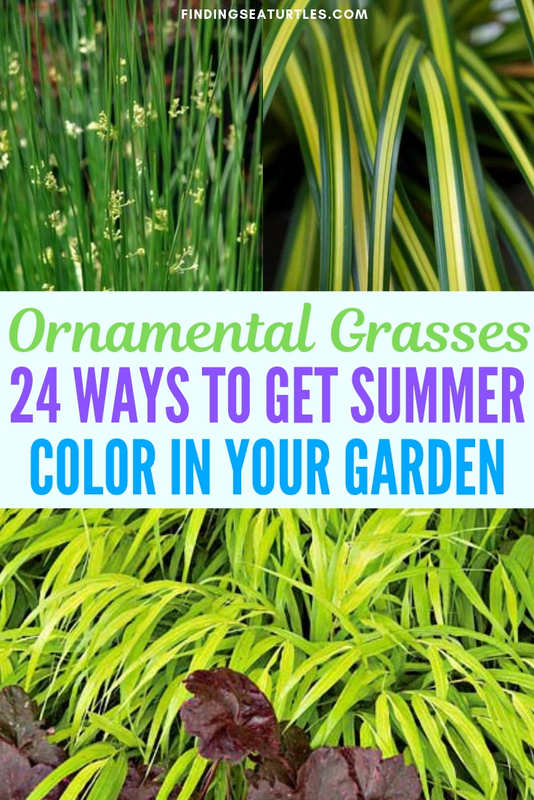 In search of plants that are colorful and can help solve some garden problems? If you are looking for some interesting plants to help with garden issues, think about the best Ornamental Grasses. Need some easy to grow and maintain plants? Need plants that offer year round interest and hardy enough to last over the winters. 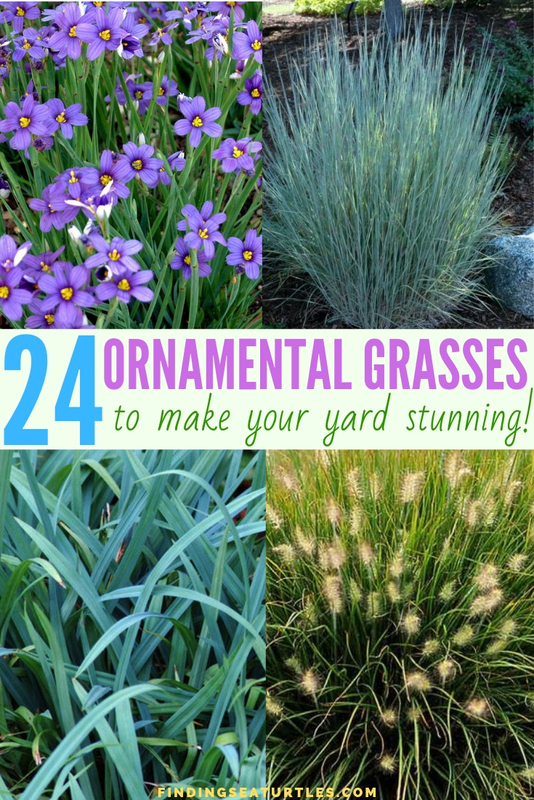 Think about Ornamental grasses. They can be the solution to many garden problems. For privacy, hardiness, aid in erosion control, provide gorgeous color and can address a variety of other garden problems. 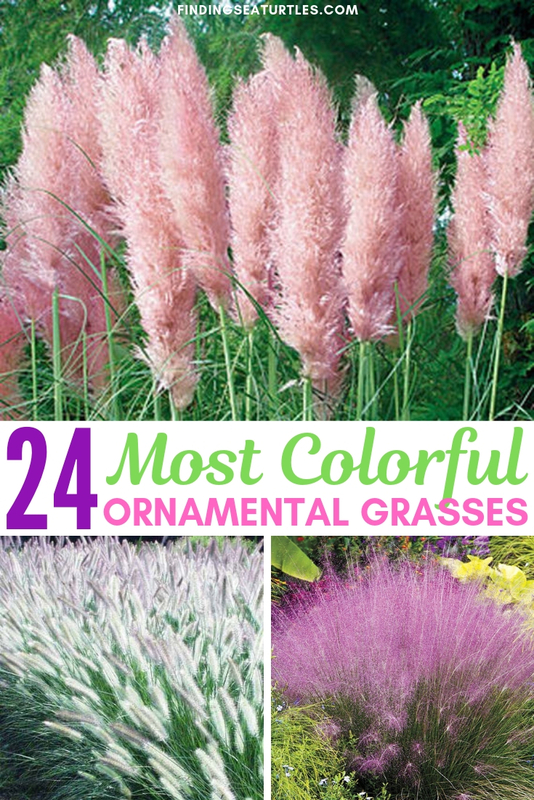 We’ve rounded up 24 of the Best Ornamental Grasses. They can brighten a dark garden area. Or make a Sunny garden area even more dramatic. 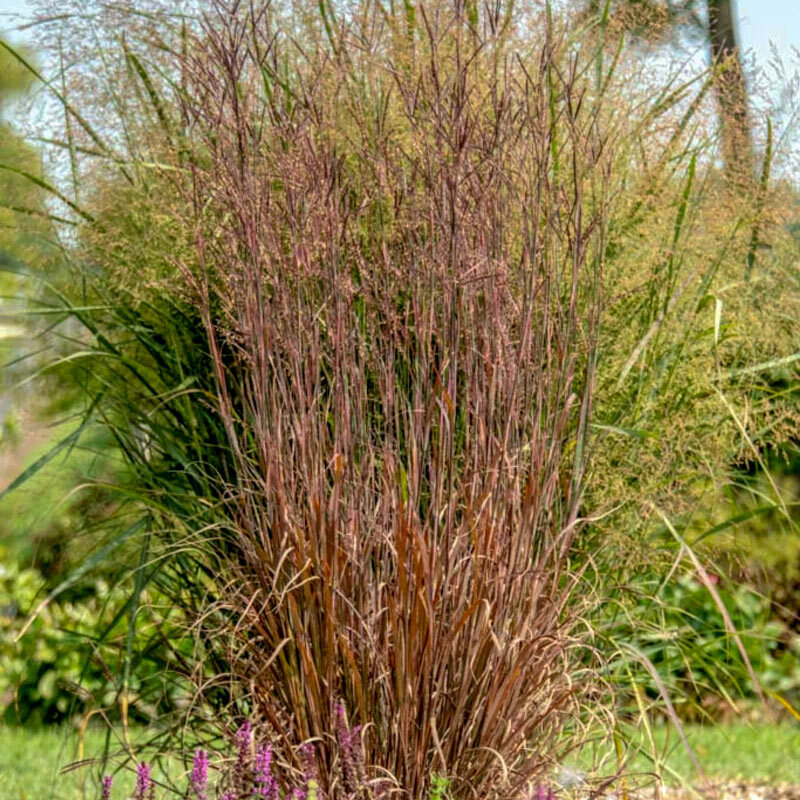 Take a look at these spectacular Ornamental Grasses that will bring drama to your landscape with these easy to care for grasses. Be sure to let us know what you think. Carex Banana Boat, also a Sedge has banana yellow blades with narrow green margins and strips. Grows in zones 5 to 9 in part Sun and part shade to full Shade. Banana Boat likes acidic soil and reaches between 6 to 12 inches tall. 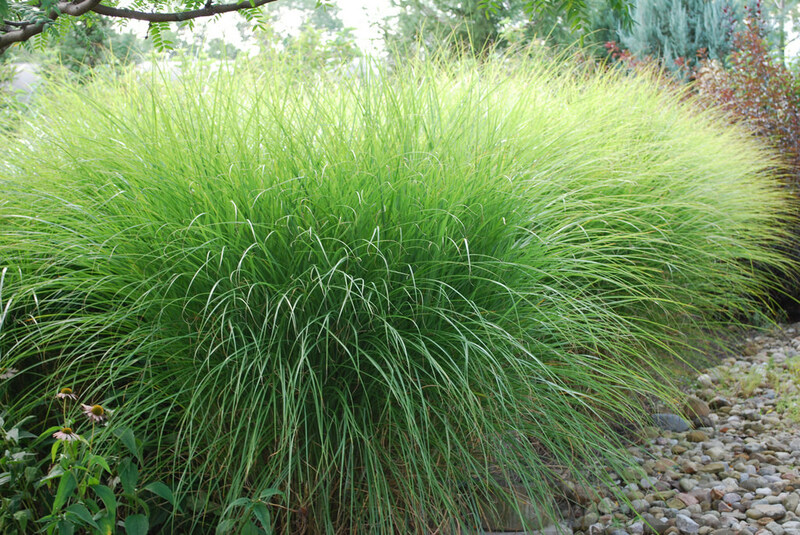 A deer resistant sedge can grow on a slope, bank, or even in a container. Use as an edger, to brighten a shady area and adds foliage contrast to the garden. Tolerant of shade and wet garden sites. And provides some Winter interest to the garden. Native Carex Blue Wood Sedge has green foliage in early Spring. As Blue Wood ages it turns to a powdery blue. Grows in zones 5 to 8 in part Sun and part shade to full shade. Tops out between 6 to 10 inches. Easy to grow Blue Wood likes normal, clay, or acidic soil. Deer resistant sedge that can be used on a slope, bank, as an edger or in containers. Tolerant of shade and wet garden sites. Blue Wood provides the garden with Winter interest. Stunning Carex Snow Cap has snow-white strap like foliage edged in a forest green margin. Snow Cap provides natural landscape lighting to your garden with its dense, upright clumping sedge. Resembles a hosta, Snow Cap provides color along streams, ponds, or moist, shady garden areas. Grows in zones 5 to 9 in half Sun and half shade to full shade. Tops out between 6 to 8 inches tall. Deer resistant Snow Cap likes soil that is normal, clay, or acidic. 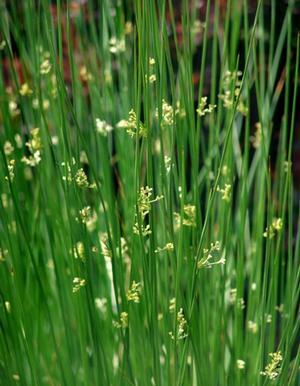 This sedge can be grown on a slope, along a bank, as an edger or in containers. Tolerant to shade and wet garden sites. Provides strong Winter interest to your garden. 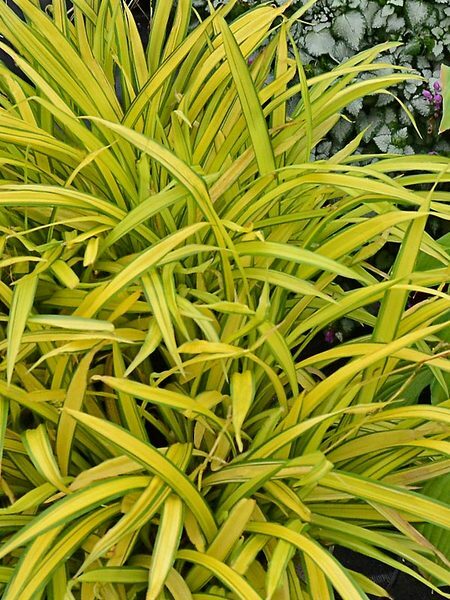 Bowles Golden Sedge Grass has bright gold foliage with narrow green margins that will dazzle in your garden. Arching habit that thrives in consistently moist soils and can grow in shallow water at the edge of a pond. Grows in zones 6 to 8 in part Sun and part shade. Reaches 2 to 3 feet tall and wide. The more Sun the Bowles Golden receives the more colorful the foliage becomes. An excellent plant for a shady garden or water garden. A moisture loving grass that grows in shallow water. Protect from winter winds with straw in northern climates. Adaptable in many soil types, Bowles Golden has a medium growth rate with low maintenance. 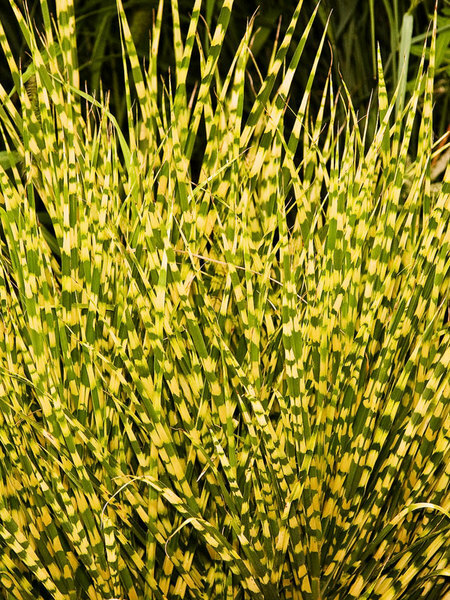 Hakonechloa macra ‘All Gold’ also called Hakone Grass or Japanese Forest Grass. All Gold has bright golden foliage with bright yellow gold in August through September. Deer resistant All Gold grows in zones 5 to 8. Likes a part Sun and part shade garden area. Tops out between 1 to 2 feet high. All Gold with its tidy and graceful form is ideal for an Asian-style garden, along a woodland path, or shady terrace. Its cascading form makes it a stunning addition to a shady garden. 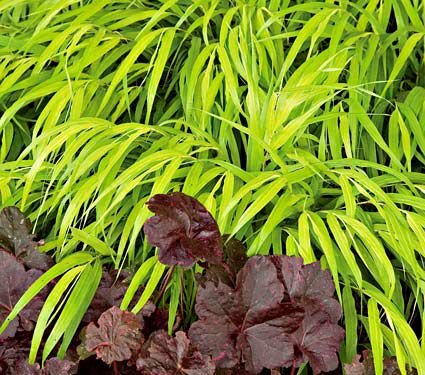 Carex Eversheen, an Evercolor® Series is a Japanese Sedge. 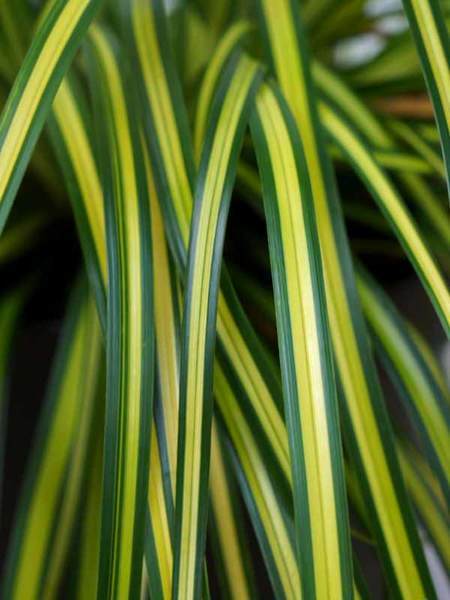 Eversheen has citrus lemon-yellow blades edged in green with a neat growing habit. Year round color with flowing arching mounds is perfect for shade and some sun. Grows in zones 5 to 9 in mostly Sunny to full shade. Reaches 12 inches tall. Eversheen likes soil that is normal, clay, or acidic. 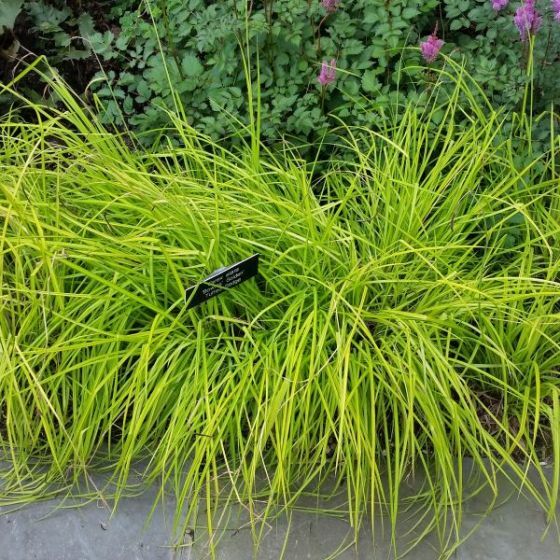 A deer resistant Sedge that grows on a slope, bank, an edger, or in a container. Tolerant of shade and wet garden sites. Provides Winter interest to the garden. Royal Purple Liriope Grass also known as Lily Turf or Monkey Grass. Royal Purple has spiked purple blooms from Mid to late Summer. Clusters of dark berries appear after the blooms have ended. Grows in zones 6 to 9 in a wide range of Sun conditions. 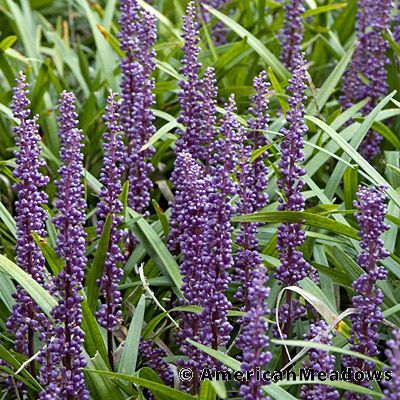 The Royal Purple Liriope grows in full Sun, part Sun to part shade, or in full shade. Reaches up to 18 inches tall and 12 to 18 inches wide. Easy to grow and low growing, Royal Purple has arching dark green grass-like foliage. Both deer and rabbit resistant, Royal Purple attracts birds. Tolerates dry garden sites and humidity. An evergreen that can be grown in containers, looks great in rock gardens and mass plantings. Likes loamy, dry, or moist wet soil. Provides Winter interest in your garden and ideal for small spaces. Hardy Northwind Switchgrass is a native grass with steel-blue leaf blades turning golden yellow in the autumn. Grows in zones 4 to 9 in part Sun and part shade to full Sun. Deer resistant Northwind reaches 4 to 5 feet tall and 2 to 3 feet wide. Attracts birds and likes soils that are sandy, loamy, dry, wet, or normal. Grow Northwind in containers or use in mass plantings. Provides Winter interest in the garden. 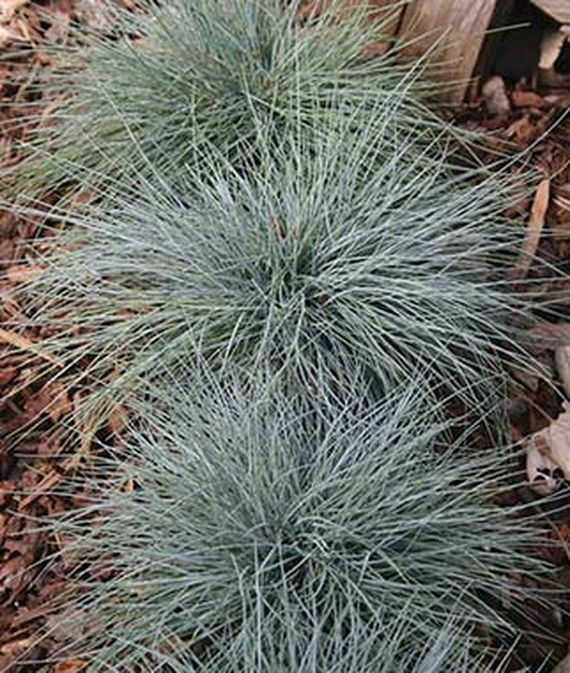 Blue Fescue Ornamental Grass has semi evergreen blades of silvery blue foliage. 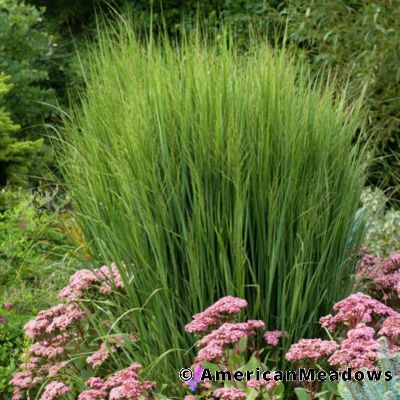 A tidy, mounded grass of silvery blue, the Blue Fescue grows in part sun and part shade to full Sun. Topping out at 10 inches tall, Blue Fescue is resistant to pests. Use as edging, groundcover, in garden beds and borders. 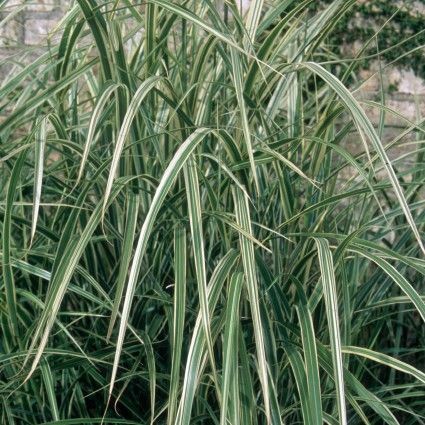 Variegated Japanese Silver Grass or Miscanthus sinensis has creamy white variegated foliage. 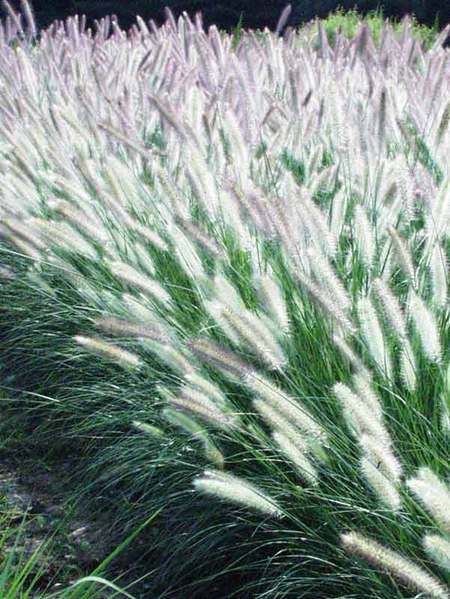 An upright, clumping grass with eye-catching flowering plumes above the arching foliage. Grows in zones 5 to 9 in part Sun and part shade or full Sun. Tops out at 4 to 6 feet tall and wide. Likes well-drained soil A gorgeous vertical accent plant, Japanese Silver makes an attractive plant near water gardens. 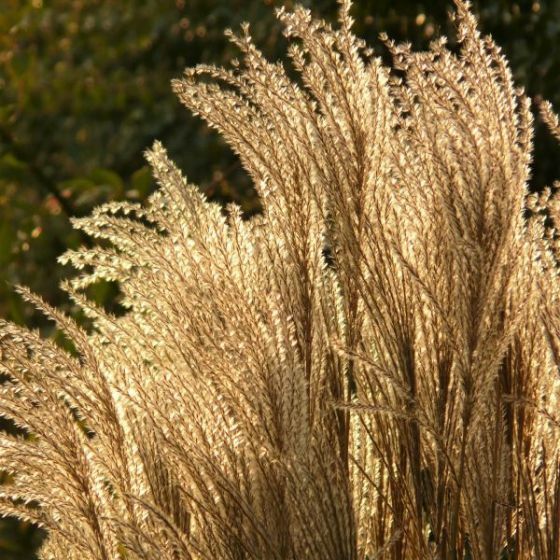 An alternative to Pampas Grass, the Japanese Silver has plumes of silvery white. The Japanese Silver offers cover opportunities for wildlife. Soft rush or common rush, Juncus effusus is a clump forming wetland plant. 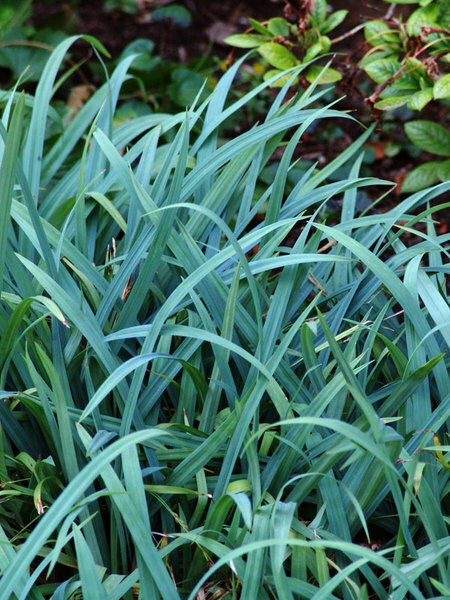 With its striking vertical upright foliage has deep green rounded stems. A North American native, Soft Rush has golden yellow blooms. Grows in zones 2 to 9 in part Sun and part shade to full Sun. Reaching 3 feet tall and 1 to 2 feet wide. Perfect for erosion control. Soft rush is deer resistant and likes wet soil conditions. Tolerant of average garden soil and drought conditions. Provides a source of food and shelter for birds and other wildlife. Blue Note Blue Eyed Grass or Sisyrinchium angustifolium has dainty violet-blue to sky-blue flowers. It is a tough wildflower with grass like clusters that form into mounds. Grows in zones 4 to 9 in part Sun and part shade to full Sun. Tops out between 12 to 15 inches tall with a spread of 12 to 18 inches wide. Likes well drained soils. A southeastern native, Blue Note is a great addition to a rock garden, along a pond, or naturalized in garden borders. A vivid blue color that is fast growing. Pink Muhly Grass or Muhlenbergia capillaris has pink flowers with purplish-red inflorescence, diffuse silky panicles 18 inches high. Blooms appear from late Summer to mid Fall. 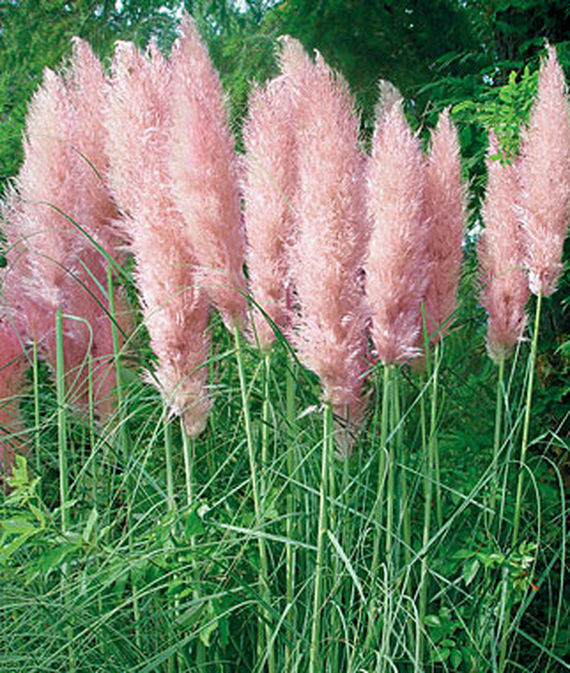 The gorgeous delicate pink plume seed heads completely cover the foliage in late summer. Foliage is a blue-green color. Grows in zones 6 to 10 in part Sun and part shade to full Sun. Tops out at 18 to 36 inches tall and 30 inches wide. Deer resistant Pink Muhly thrives in most soils. Tolerant of heat, humidity, and drought conditions. Native Pink Muhly is low maintenance and makes stunning dried floral arrangements. 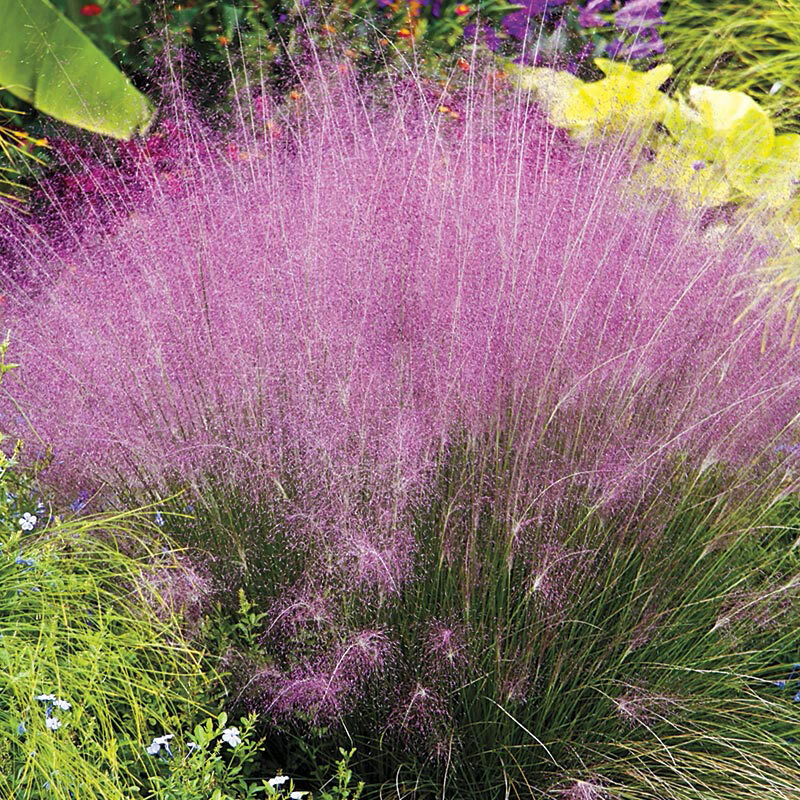 Strikingly beautiful pink muhly can be planted en masse, on the patio in a container, or in the landscape. Blackhawks Big Bluestem begins dark green in color. Foliage begins to turn dark purple eventually turns to nearly black in the Fall. Dark colors are known for adding depth and drama to the landscape. Grows in zones 3 to 9 in part Sun and part shade to full Sun. Reaches between 4 to 5 feet tall with a spread of 18 to 30 inches wide. Blooms in late Summer to early Fall. Plant Blackhawks for erosion control and in sandy soil conditions. Tolerant of a number of soil conditions except wet soil condition. Provides vertical interest especially when planted en mass. Miscanthus Gracillimus or Maiden grass has narrow leaves with white mid-ribs and vase-like form. Gracillimus has coppery-pink plumes during the Fall season. Grows in zones 5 to 9 in part Sun and part shade to full Sun. Reaches 6 to 7 feet tall and 5 feet wide. Tolerates heat and humidity. Use as a specimen, along the border, or plant en mass. Deer resistant that is tolerant of well-drained sandy soil to heavy clay. 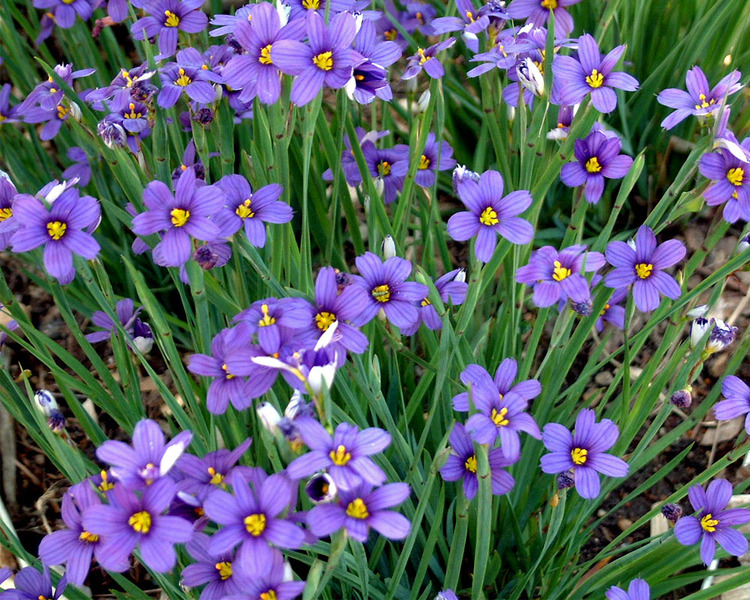 Blue Eyed Grass or Sisyrinchium angustifolium Lucerne has star-like violet-blue flowers with a yellow center. Blooms are 1 inch wide and appear in late Spring to mid Summer. Grows in zones in 4 to 9 in full Sun to mostly Sunny. Reaches 6 to 10 inches tall. 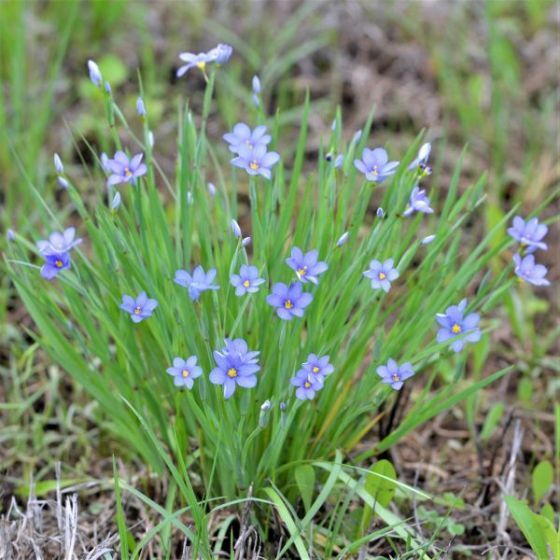 Deer resistant Blue Eyed Grass can be used on a slope or bank. Long blooming and tolerant of wet garden sites. Attracts butterflies, the Blue Eyed Grass softens and provides texture and contrast to rock gardens. 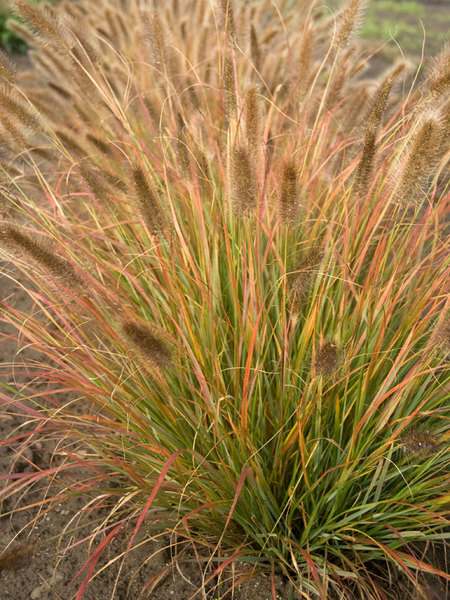 Pennisetum alopecuroides Foxtrot, also known as Fountain Grass, Pearl Millet has tall tan pink-tinted 6 to 8 inch plumes. Blooms early Summer to early Fall. Grows in zones 5 to 9 in full Sun to mostly Sunny conditions. Reaches 4 feet tall. Deer resistant Foxtrot likes soil that is normal, clay, or sandy. Foxtrot can grow on a slope or bank. Tolerant of humidity and hot dry garden sites. Long blooming Foxtrot provides Winter interest in the garden. 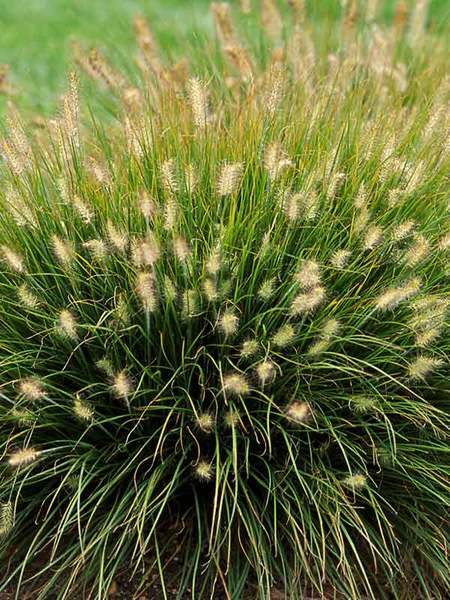 Pennisetum alopecuroides Little Bunny is also known as Fountain Grass and Pearl Millet. Little Bunny has dark green petite foliage in a tidy mound. Blooms in early Summer to mid Fall. Seed heads are buff colored and rest above the foliage. Grows in zones 5 to 9 in full Sun to mostly sunny garden areas. Tops out between 8 to 10 inches tall. Likes soil conditions such as normal, clay, or sandy soil. Deer resistant Little Bunny is long blooming and tolerates humidity. Grow on a slope or bank garden area. Provides Winter interest to the garden. Little Bunny can be grown in containers as well. Pennisetum alopecuroides Desert Plains also part of the Prairie Winds Series, and known as Fountain Grass and Millet. Desert Plains has 5 inch long smoky-purple plumes that age to tan. Finely textured green blades are eye-catching in the landscape. Fall foliage are in shades of deep red, orange, and gold. Blooms in early Summer to mid Fall. Grows in zones 5 to 9 in full Sun to mostly sunny areas. Reaches 3 feet tall. Likes soil that is normal or sandy. Deer resistant Desert Plains is tolerant of humidity and hot dry garden sites. Plant Desert Plains on a slope or bank. Provides the garden with Winter interest. Schizachyrium scoparium Blue Paradise is part of the Prairie Winds® Series. Also known as the Little Bluestem, Bluestem. Easy to grow Blue Paradise has striking silvery blue stems. In the Fall, seed heads emerge on the stems as the grass develops into a deep wine-purple color. Blooms early to late Fall with seed heads. Grows in zones 3 to 9 in full Sun to mostly sunny. Reaches 36 to 42 inches tall. Likes soil conditions that are normal or clay soil. Deer resistant Blue Paradise is tolerant of hot dry garden sites, humidity, and seaside salt conditions. Native Blue Paradise likes dry soils. Use on a slope or bank. Miscanthus Gold Bar also known as Maiden Grass or Eulalia. Plumes emerge in burgundy-red maturing to a beige color. Blooms appear in early to late Fall. Grows in zones 5 to 8 in full Sun. Topping out at 4 feet tall. Likes soils that are Normal, Clay, or Sandy soil. Gold Bar provides Northern gardens with the Pampas Grass appeal since the Pampas Grass is too tender for the north. Deer resistant Gold Bar is tolerant of humidity and hot dry garden sites. Miscanthus are known as the royalty of the grass kingdom with its billowy texture, silky tassels, and varying heights and colors. Provides the garden with Winter interest. Silver Feather Maiden Grass has silver plumes that glow in the setting Sun. 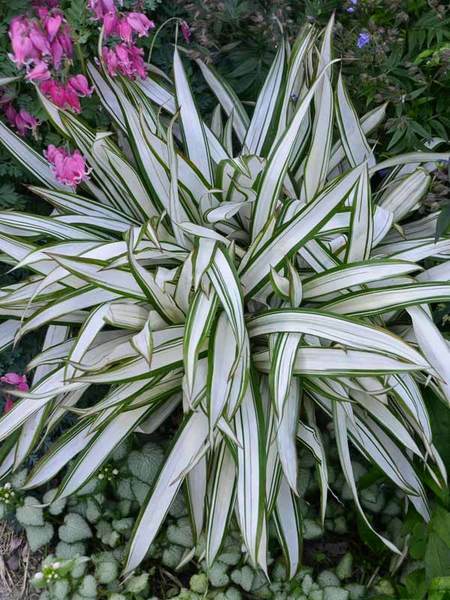 Dramatic Silver Feather has striped leaves with large plumes. Grows in zones 4 to 9 in full Sun. Reaches 6 to 8 feet tall and 4 to 5 feet wide. Likes well draining and moist soil. Hardy Silver Feather provides Winter interest to the garden. 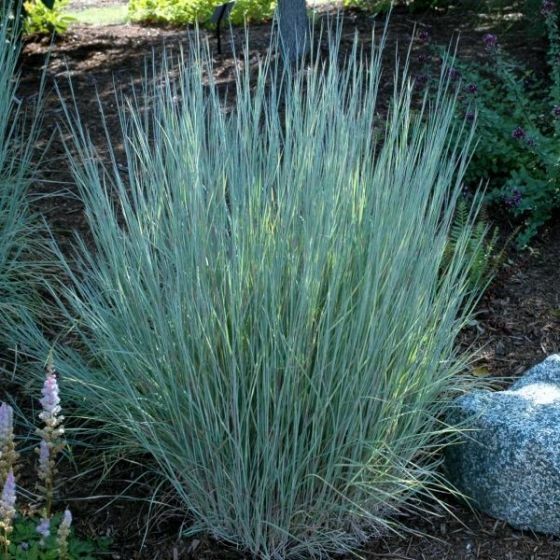 Easy to care for Silver Feather provides a dramatic backdrop to smaller shrubs and plants. 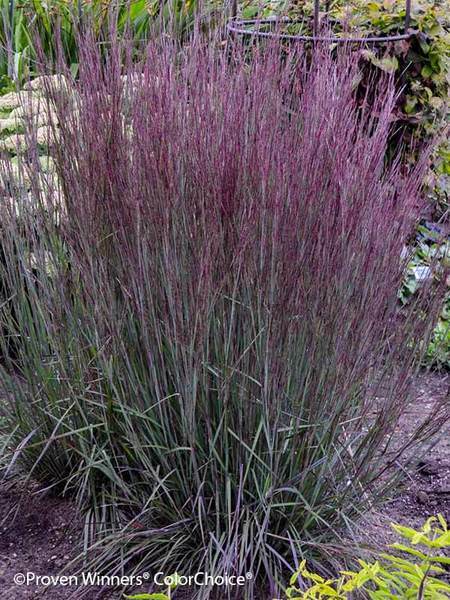 The Blues Little Bluestem Grass has deep blue foliage that becomes burgundy red in the Fall. Grows in zones 4 to 9 in full Sun. Reaching 2 to 3 feet in height with a 24 to 30 inch spread. An upright, The Blues is tolerant of drought conditions. Provides birds with a source of food with nesting and cover opportunities. Brilliant Fall color that looks spectacular in mass plantings and provides the garden with Winter interest. Pink Pampas Cortaderia has silky plumes 2 feet long on 6 to 7 feet long stalks in early Summer to mid Autumn. Plumes are pinkish beige to sand-pink to light salmon pink. Grows in zones 7 to 10 in full Sun. Reaches between 6 to 7 feet tall and 3 to 4 wide. Use dramatic Pink Pampas in dried floral arrangements. A deer resistant grass, plant Pink Pampas in garden beds and along the garden borders. 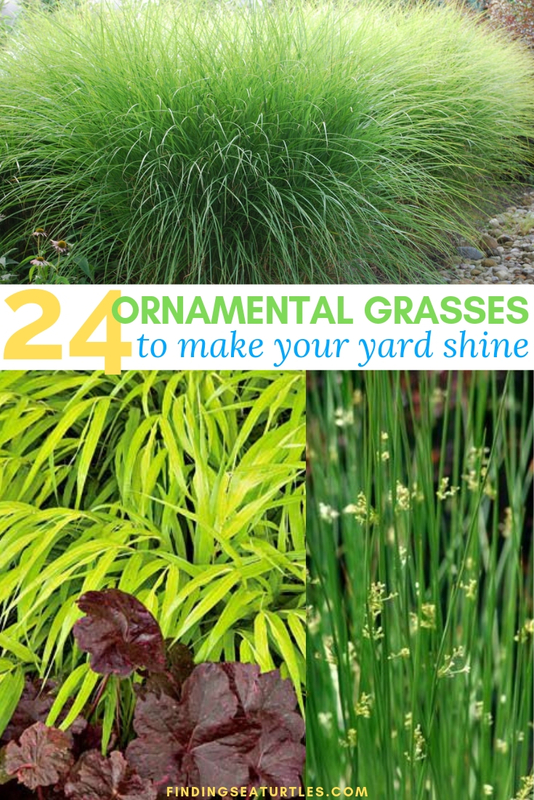 These are 24 Best Ornamental Grasses for your garden that will help with erosion control, provide privacy, and deliver stunning color to your shade or sunny garden areas. Amazing selection. Don’t you think so? 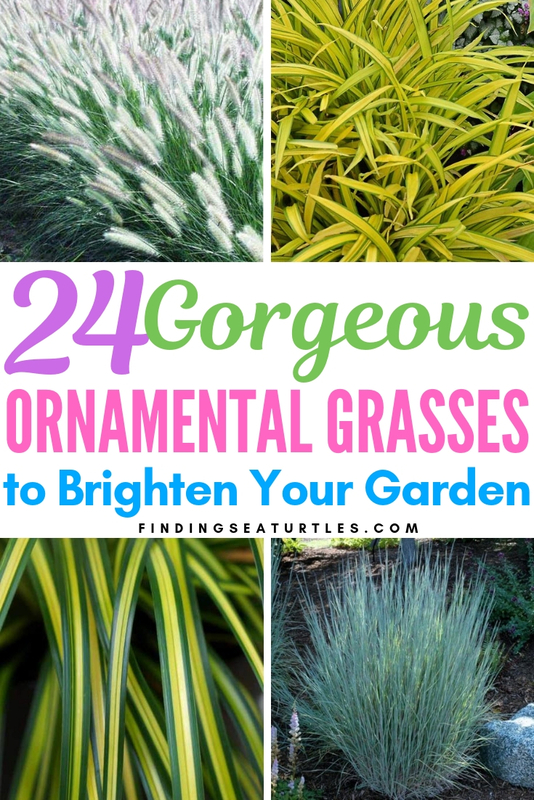 If you try these 24 Best Ornamental Grasses for Your Garden be sure to let us know how you make out. And if you have any questions, feel free to reach out to us. We always are ready to help you out. Thank you for dropping by.